The restive Mt. Kanlaon in Negros Island generated a steam-driven or low-energy phreatic eruption this morning, according to the Philippine Institute of Volcanology and Seismology (Phivolcs). The eruption happened around 9:47 a.m. today and lasted approximately 10 minutes, based on Mt. Kanlaon's seismic monitoring network. 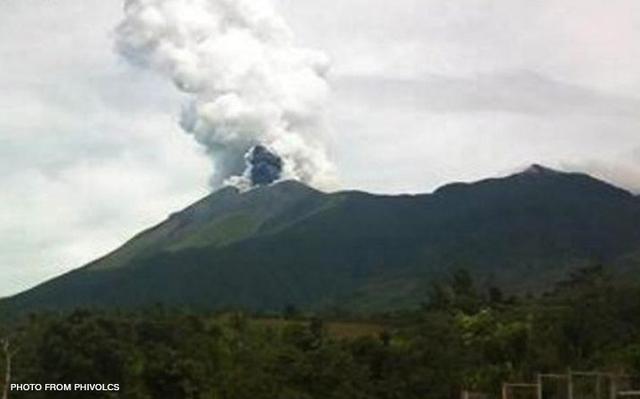 Phivolcs said the volcano ejected steam and dark ash but was poorly observed due to clouds covering the summit region. Likewise, rumbling sound was reportedly heard in Barangay Manghanoy, La Castellana, and thin ash was observed in Sitio Guintubdan, Barangay Ara-al, La Carlota City. Phivolcs also noted that the eruption was preceded by a resumption of degassing at the summit crater at 6:34 a.m. today, which was last observed in September 2016. On Nov. 15, Phivolcs raised Kanlaon Volcano's alert level to 2, meaning the volcano is undergoing a moderate level of unrest. It said the volcano's alert level 2 status prevails. Phivolcs warned that there is a probable intrusion of magma at a depth which may or may not lead to a magmatic eruption. It reminded the concerned local government units and the public of the strict entry into the four-kilometre radius permanent danger zone (PDZ). The entry into the PDZ is strictly prohibited due to the further possibilities of sudden and hazardous steam-driven or phreatic eruptions, Phivolcs said.